In a corner of Ms Tandel’s nursery class in Colaba, 17 hyper toddlers are jumping up and down. They’ve been promised a puppet show, and having spent the last 15 minutes singing songs, including Pussycat, Pussycat and I’m a little Tea Pot , they are starting to get restless. In a corner, Safa Shaikh, a six-year-old dwarfed in size by her classmates, is feeding her friend Irfan Sayed, 5, biscuits. 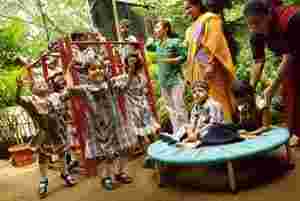 Founded in 1973 by Mithu Alur for her daughter Malini, who was born with cerebral palsy, the school—now with branches in Colaba and Bandra, and anganwadis (childcare centres) in Dharavi—was initially meant only for the physically and mentally disabled. However, after extensive research, Alur concluded that an inclusive policy was more beneficial—this led to the forming of The National Resource Centre for Inclusion in 2000. The Colaba school, in a leafy enclave overlooking the sea, is the first branch to integrate the two groups. Here, with the help of sponsors, donations and grants from the Spastics Society of India, about a 100 schoolchildren, from playschool to class IV, learn math, English, Hindi, science, computers and undergo physical therapy and vocational training. After class IV, some are placed in one of the 60 partner regular schools across the city, or moved to the Bandra branch, which educates children up to class X. As a volunteer, I am meant to help the teacher and her assistant, sometimes helping with writing and learning, but generally making sure the children are paying attention and sitting in an orderly fashion. Which is not to understate the intense attention this requires. Like all nursery classes, this one isn’t without its share of hyper, naughty kids, all vying for a chance to be heard. “Pussycat, Pussycat" soon degenerates into a giggling, shouting match, with most of the 17 voices reciting the rhyme in disparate waves. At one level, it is easy enough to forget that some of the children are here not as a basic right but as a hard-won opportunity. A wheelchair tucked in the corner, a walker against the wall are reminders that the school is a haven of sorts. Here they paddle in the inflatable pool, learn geography and jump on the trampoline, knowing that they are, at some fundamental level, being looked after. Amazingly, no one seems to take this for granted, neither the children, nor the teachers, some of whom have had first-hand experience of raising—and losing—a child to debilitating disabilities. Back in Ms Tandel’s classroom, playtime is announced; the children are hustled into single file formation, nearly airborne with excitement. It is only now that the children’s disabilities become obvious—Irfan, unable to walk without assistance, is cradled in the arms of his helper. Safa, who cannot communicate properly, leads her classmates in a human chain around the jungle gym. Like the rest of their classmates, however, the two seem oblivious to their obstacles. Playtime isn’t over yet, and they have every intention of enjoying it before returning to their lessons. Volunteering may be as simple as pitching in one day a week, looking after administrative tasks, or finding jobs for the school’s young graduates. “It doesn’t have to be hands on. We can use the benefit of someone’s talent or skill," says Varsha Hooja, Adapt’s director of technical operations. Money: Rs4,000 will sponsor one child per month, paying for therapy, education and transport. Donors can also pay for wheelchairs, canes, walkers and medical equipment, as well as caretakers’ salary, maintenance costs and vehicle repairs. Time: The school accepts volunteers who can teach at its art or music clubs or, more urgently, provide job placements for its graduates. It also accepts help from therapists, medical practitioners and other professionals willing to donate their services at nominal or no cost. Money: Rs16,000 will sponsor a child for one year, paying for food, transport and therapy fees; Rs5,000 will pay for the food expenses of six children per month; Rs1,000 will pay for one custom-made chair per child. Time: People are accepted on the basis of their skills. Individuals and corporations can also help organize festivals and events such as Sports Day, Children’s Day, and Diwali. Money: People can donate any amount they choose, paying for therapy, education, food or sponsoring specific programmes. Time: Volunteers are chosen on the basis of their skills. Email ‘enable@vsnl.com’ for information on how you can volunteer.